Ian's work with the "virtual" theatre company L.A Theatre Works can be purchased through their web site by following this link. This includes a memorable production of Blithe Spirit. 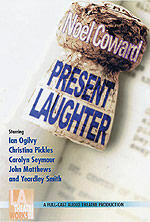 The Noel Coward comedy was recorded in Santa Monica and broadcast on KCRW 89.9 FM (Los Angeles) in September 99. 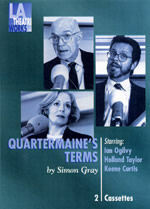 Ian co-starred along with his Return of the Saint co-stars Judy Geeson and Carolyn Seymour.